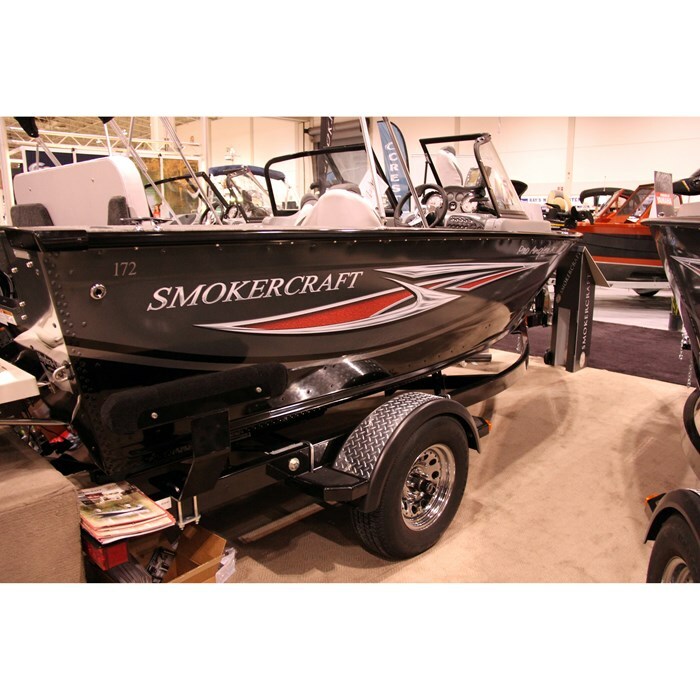 For 2014, Smoker Craft offers forty-six models of aluminum fishing, utility, and Jon boats from ten to twenty-two feet. The 172 Pro Angler XL subject of this review is part of the twenty-three models in the fishing category comprising seven series. The Pro Angler series consists of six models of side and dual-console boats in sixteen and seventeen feet. The dual-console 172 Pro Angler XL with a tall, full walk-thru curved windshield is 17’3” long with a full 8-foot beam which extends full-width right to the transom. It rides on Smoker Craft’s Hydra-Lift, one-piece, rolled V-hull with double riveted seams, reverse chines, integrated spray rails and five external longitudinal bottom keels. Constructed of .100” gauge aluminum in the hull bottom and .080” gauge in the sides, the 17° deadrise V-hull is strengthened on the inside with Smoker Craft’s Advanced Integrated Rib System (AIRS) which places .100” gauge “hat-shaped” ribs on ten-inch centres. This is a deep hull for added security and safety measuring 40” on the outside from gunwale to keel and 25” on the inside from floor to gunwale at the deepest points. Because of this depth, it requires an XLS – Extra-Long Shaft motor with a maximum recommended horsepower rating of 150. Because of its dimensions, it is rated to carry seven persons or a total of 1,750 pounds. Cockpit flooring with its standard vinyl covering is constructed of specially treated XL 7-layer plywood which carries a lifetime warranty. Solidifying this floor and providing sound insulation and buoyancy is urethane foam which is injected into all cavities between the inner hull and the floor. 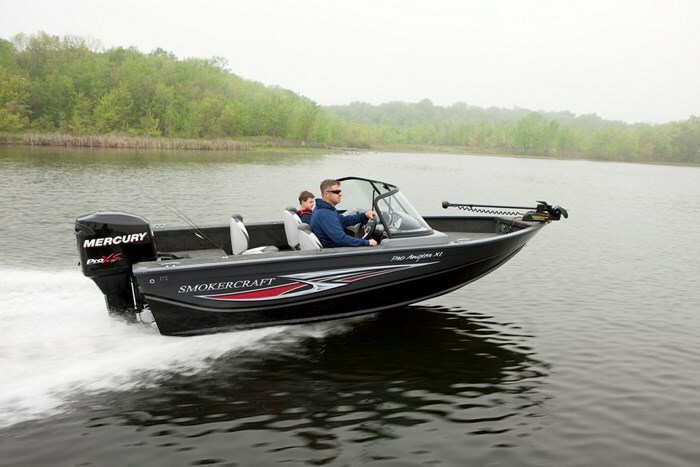 On the subject of warranties, Smoker Craft claims the industry’s best with a limited lifetime warranty on hull and structure and a six-year warranty on all components, carpet, upholstery, and electronics. This warranty includes all parts and labour and is transferrable to a second owner. All of the above means that the 172 Pro Angler XL is ideally suited for the weather and water conditions experienced by avid anglers in our rich and abundant Canadian fishing waters. It is loaded with fishing-friendly features designed to make those hours out on the water just so much more enjoyable and rewarding. Three wood-free deluxe fishing seats are supplied standard and can be moved to any of the six in-floor bases provided; one on each fishing deck plus four within the cockpit. The driver’s seat is mounted on an adjustable slider. Additional seats are optionally available. 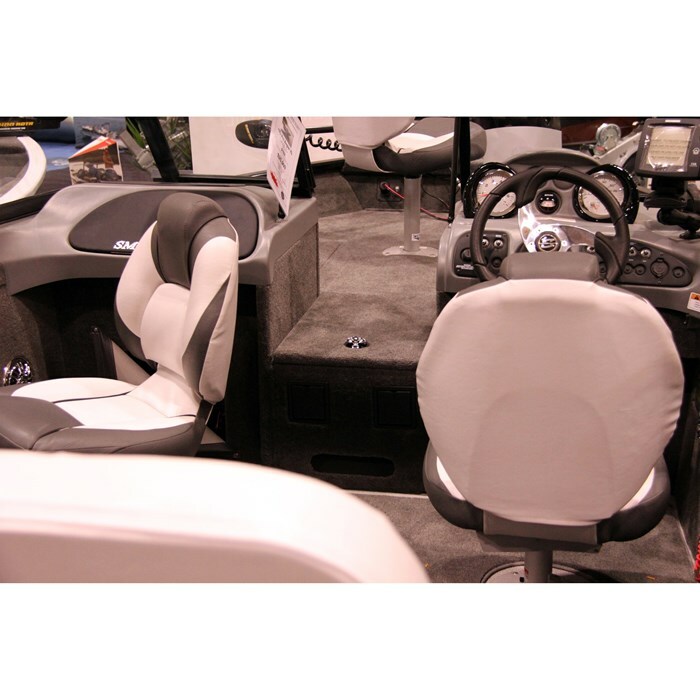 The carpeted raised bow casting deck features a port side 15-gallon aerated and timed livewell along with an even larger starboard side in-floor storage compartment. A centre in-floor lockable rod storage locker with easy accessibility from either helm position has dedicated tubes for up to eight rods up to 7½-feet long. Both sides of the wide cockpit offer top-loading gunnel storage compartments with lower level cockpit side storage. The port side gunnel locker will accommodate rods up to 8-feet in length. There is another in-floor storage compartment just ahead of the carpeted stern casting deck and a second even larger 25-gallon aerated and timed livewell with separate built-in bait bucket occupies the port side of this rear casting deck while another storage compartment is found on its starboard side. 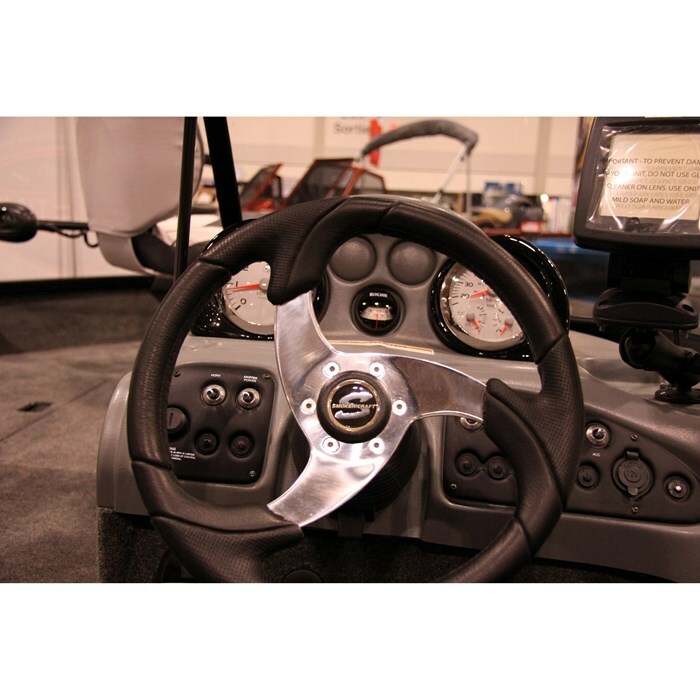 The very modern-looking molded helm of the 172 Pro Angler XL features standard tilt steering and full instrumentation consisting of two large gauges; a tachometer on the left and a multi-gauge to the right of centre consisting of a speedometer, voltmeter, and fuel gauge. A Ritchie in-dash compass is centred between these two. Knock-outs are provided for mounting of an optional in-dash depth finder or perhaps a trim gauge. A 12-volt receptacle is also provided standard. A flat surface beside the instrument cluster is ideal for mounting the optional Humminbird fish-finder or any model of your choice. A glove box on the passenger console is topped with a handy and accessible tackle box while even more storage can be found beneath each console. Notable options available for the 172 Pro Angler XL include an All Weather package providing snap-in carpet, a fisherman’s top, plus mooring cover and a Power Pack package which includes among other items, a 70PD trolling motor and quick disconnect. 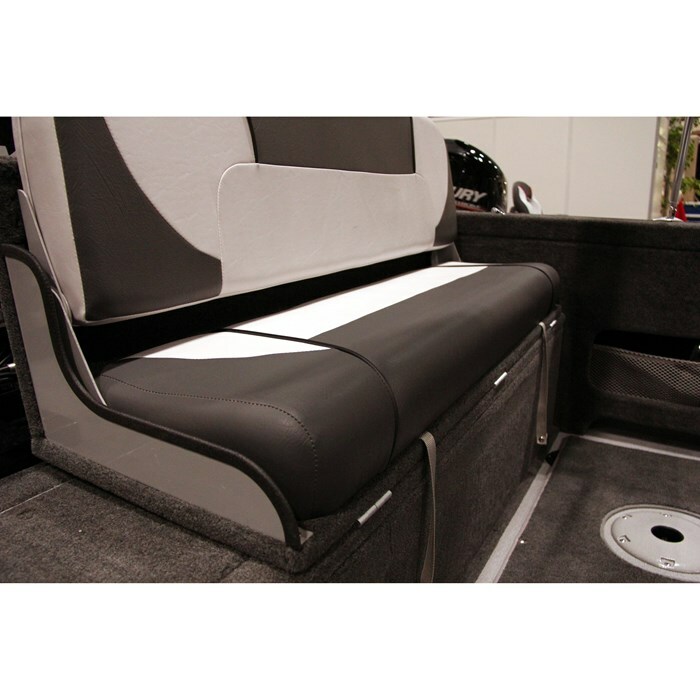 Other available options include a 5 or 10-amp 2-bank battery charger, a rear flip-down split bench seat, AM/FM stereo with MP3 port, plus several highly desirable canvas covering options. Indeed the Smoker Craft 172 Pro Angler XL is ideally suited for most Canadian fishing enthusiast.